The Tayleur, built in 1853, was the largest sailing ship ever built in Britain at the time of her launch, being 1,977 tons. She sailed from Liverpool for Melbourne on her maiden voyage on Thursday 19 January 1854, carrying 581 passengers and 71 crew. Encountering rough weather as soon as she emerged into the Irish Sea, the Tayleur’s navigational instruments proved faulty and in appalling visibility she was wrecked on Saturday 21 January on rocks at Lambay Island, having first attempted to anchor and weather the storm. Panic spread through the people on board, some of whom managed to scramble on the Island. Of the passengers and crew, some 380 were drowned, many of these being women and children. News of the tragedy quickly spread and charitable donations poured in to assist the survivors, many of whom were left destitute as a consequence of the wreck. Some of this charity was channelled through a Dublin committee chaired by Lord Talbot de Malahide (the then owner of Lambay Island), the surplus money from which was used to establish a ‘fund available at once for such shipwrecked strangers as may become future claimants on the generosity of the citizens of Dublin’. It was from this distinctively Irish fund that the Tayleur Fund Medal was inaugurated. Some 44 medals are currently thought to have been awarded by the Fund, of which three were in gold, the remaining 41 being silver awards. The medals themselves are rather large for wearing, being approximately 45mm in diameter and hand usually on a navy blue ribbon from an ornate scroll suspension. 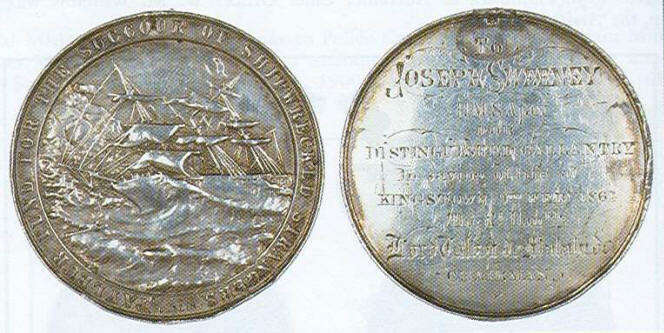 The front of the medal shows a representation of the wreck of the Tayleur, surrounded by the inscription ‘TAYLEUR FUND FOR THE SUCCOUR OF SHIPWRECKED STRANGERS’, while the otherwise plain reverse carries the name and brief details of the individual recipients. At least seven different rescue attempts were recognised by the Fund, beginning in February 1861 when the Neptune, the Industry and several other ships were wrecked at Dun Laoghaire during a tremendous storm and several of the would be rescuers, including their leader, Captain John McNeil Boyd, RN, of Donegal, were killed. A statue to Boyd was later erected in St Patrick’s Cathedral, Dublin and at least 29 medals were awarded by the Fund. The second rescue was by a seaman, Henry Crout, who saved a man from drowning in the Mersey in 1863. A third medal incident appears to have occurred in 1869, as a medal exists named (although engraved in a rather different style to that usually seen) to a William Bliss, apparently awarded for a rescue in Dun Laoghaire. The fourth and fifth rescue attempts occurred in rapid succession in February 1873, these concerning the wrecks of the Sarah Ann at Balbriggan on 1-2 February and the Ada at Portrane on 2 February, for which four and five medals were awarded respectively. It was for the former rescue that Thomas Woodley received his medal, previously noted on this site in September 2004. The sixth incident for which the Fund awarded medals was to those involved in the rescue of the crew of the Belle Hill, wrecked at Balbriggan on 26 February 1875, three medals being granted, while possibly the final award was to a William Wisnom for a rescue in Belfast Lough. In 1913 the Tayleur Fund was finally wound up, the trustees donating the residual money (about £1233) in the fund to the RNLI on condition that they supply a motor-lifeboat to the Dun Laoghaire Lifeboat Station. What follows are brief details of the known winners of the Tayleur Fund’s medals, a high percentage of whose medals survive to this day – a testimony surely of the high esteem in which they were held by the men who won them. Beer, James. HMS Ajax. Tayleur Fund Medal in silver. 9.2.1861. Dublin. Award: For bravery in attempting to save lives at Kingstown on 9 February 1861 when the Neptune and several other ships were wrecked during a gale. See John McNeil Boyd for further details. Biddlecombe, George. HMS Ajax. Tayleur Fund Medal in silver. 9.2.1861. Dublin. Bliss, William. HMS Royal George. Tayleur Fund Medal in silver. 4.10.1869. Dublin. Boyd, John McNeil. Captain, RN. HMS Ajax. Sea Gallantry Medal in silver; RNLI silver medal; Tayleur Fund medal in gold (all awarded posthumously). 9.2.1861. Dublin. Awards: The RNLI citation read how on 9 February 1861 Captain Boyd, Lieutenant Dyer and Mr Farrin, all serving in the screw steamer HMS Ajax, assisted to save the crew of the brig Neptune wrecked during a heavy gale on the East Pier of Kingstown, Co Dublin. Captain Boyd, with other members of his crew, was swept to his death off the pier. The silver medal, accompanied by a letter of condolence, was presented to his widow. The presentation of the Sea Gallantry Medal to Boyd’s widow, the medal being named “To CORDELIA, Widow of JOHN McNEIL BOYD, Captain R.N. Wreck of the Neptune off Kingstown, February 9, 1861” was described in the Illustrated London News, which article was reprinted in LSARS Journal, 1997, 29: 76. Biographical details: Boyd came from Donegal. A memorial to Boyd was erected in St Patrick’s Cathedral, Dublin, while one commemorating all those who had died was built at the East Pier, Kingstown harbour and another marked the grave at Carrickbrennan Cemetery, Blackrock. Boyd, William. AB, HMS Ajax. Tayleur Fund Medal in silver. 9.2.1861. Dublin. Award: For bravery in attempting to save lives at Kingstown on 9 February 1861 when the Neptune and several other ships were wrecked during a gale. See John McNeil Boyd for further details. Boyd was lacerated around his face and left side. Burke, Bernard. Captain of the Hold, HMS Ajax. Tayleur Fund Medal in silver. 9.2.1861. Dublin. Award: For bravery in attempting to save lives at Kingstown on 9 February 1861 when the Neptune and several other ships were wrecked during a gale. See John McNeil Boyd for further details. Burke sustained lacerations to his left hand during the rescue efforts. Burke, John. HMS Ajax. Tayleur Fund Medal in silver. 9.2.1861. Dublin. Carton, James. Fisherman. Tayleur Fund Medal in silver. 26.2.1875. Dublin. Award: For bravery in attempting to save, with others, the crew of the Belle Hill, wrecked on 26 February 1875 at Balbriggan while en route from Liverpool to Valparaiso. Awards also to James Murphy and John Carvin. Carvin, John. Tayleur Fund Medal in silver. 26.2.1875. Dublin. Award: For bravery in attempting to save, with others, the crew of the Belle Hill, wrecked on 26 February 1875 at Balbriggan while en route from Liverpool to Valparaiso. See James Carton for further details. Crout, Henry E. HMS Edgar. Tayleur Fund Medal in silver. 19.9.1863. Liverpool. Award: For gallantry in saving life in the River Mersey on 19 September 1863. Davis, John. Tayleur Fund Medal in silver. 2.2.1873. Dublin. Award: For bravery at the wreck of the Ada at Portrane on 2 February 1873. See Joseph Davis for further details. Davis, Joseph. Tayleur Fund Medal in silver. 2.2.1873. Dublin. Award: For bravery at the wreck of the Ada at Portrane on 2 February 1873, when, accompanied by his brothers, John and William Davis, Charles Smart and Coastguard Richard Twohig, Portrane man Joseph Davis rescued the three surviving crew who had lashed themselves to the rigging, the fourth member of the crew, the 14 year old son of the captain having died of exposure. Davis, William. Tayleur Fund Medal in silver. 2.2.1873. Dublin. Deneen, Denis. 82F Constable, DMP. Tayleur Fund Medal in silver. 9.2.1861. Dublin. Award: For bravery in attempting to save lives at Kingstown on 9 February 1861 when the Neptune, the Industry and several other ships were wrecked during a gale. See John McNeil Boyd for further details. Deneen was primarily responsible for the rescue of the Master of the Industry, James Collins, who he rescued by rushing into the water, shielding himself behind rocks from incoming waves and then rushing further out to grab Collins by the hand and helped by others drag him back to safety. Doherty, George. OS, HMS Ajax. Tayleur Fund Medal in silver. 9.2.1861. Dublin. Award: For bravery in attempting to save lives at Kingstown on 9 February 1861 when the Neptune and several other ships were wrecked during a gale. See John McNeil Boyd for further details. Doherty was very active in saving those who were injured. Dyer, Hugh McNeil. Lieutenant, RN, HMS Ajax. RNLI silver medal; Tayleur Fund Medal in gold. 9.1.1861. Dublin. Awards: Dyer received his RNLI and Tayleur Fund medals for bravery when on 9 February 1861 he, Captain Boyd and Lieutenant Dyer, all serving in the screw steamer HMS Ajax, assisted to save the crew of the brig Neptune which was wrecked during a heavy gale on the East Pier in Kingstown. Captain Boyd, with other members of his crew, was swept to his death off the pier. See John McNeil Boyd for further details. Ellison, Robert. Boatman, HM Coastguard. Tayleur Fund Medal in silver. 1-2.2.1873. Dublin. Award: For bravery on 1 and 2 February 1873 at the wreck of the schooner Sarah Ann at Balbriggan, six of the men who manned the lifeboat being drowned when it capsized. See William Scantlebury for further details. Farrin, George. Master Gunner of HMS Ajax. RNLI silver medal; Tayleur Fund silver medal. 9.2.1861. Dublin. Award: Farrin received his RNLI medal for bravery when on 9 February 1861 he, Captain Boyd and Lieutenant Dyer, all serving in the screw steamer HMS Ajax, assisted to save the crew of the brig Neptune which was wrecked during a heavy gale on the East Pier in Kingstown. Captain Boyd, with other members of his crew, was swept to his death off the pier. See John McNeil Boyd for further details. Farrin sustained severe lacerations to his head during the rescue efforts. Biographical details: Farrin was born around 1802 and when he was 20 entered the Royal Navy, in 1822. He was promoted Able Seaman in 1827; Captain of the Main Top in 1836; Captain of the Forecastle in 1840; Gunner’s Mate in 1844; Gunner 3rd Class in 1848; Gunner 2nd Class in 1855; Gunner 1st Class (acting) in 1858; Gunner 1st Class in 1860. He served in the Crimean War, 1854-56, for which service he was awarded the Baltic 1854 and Crimea Medals. Farrin was pensioned from the service on 18 May 1870. Ferguson, William. Captain of the Afterguard, HMS Ajax. Tayleur Fund Medal in silver. 9.2.1861. Dublin. Award: For bravery in attempting to save lives at Kingstown on 9 February 1861 when the Neptune and several other ships were wrecked during a gale. See John McNeil Boyd for further details. Ferguson fractured a rib and right hand as well as sustaining severe lacerations to his right hand during the rescue efforts. Ferris, William. Captain of the Mizzen Top, HMS Ajax. Tayleur Fund Medal in silver. 9.2.1861. Dublin. Award: For bravery in attempting to save lives at Kingstown on 9 February 1861 when the Neptune and several other ships were wrecked during a gale. See John McNeil Boyd for further details. Ferris severely sprained his ankle during the rescue efforts and contracted a severe cold after his protracted immersion in the sea. Fynes, William. Captain of the Main Top, HMS Ajax. Tayleur Fund Medal in silver. 9.2.1861. Dublin. Award: For bravery in attempting to save lives at Kingstown on 9 February 1861 when the Neptune and several other ships were wrecked during a severe gale. See John McNeil Boyd for further details. Fynes fractured a rib and sustained a severe contusion to his left knee during the rescue efforts. Griffiths, John. AB, HMS Ajax. Tayleur Fund Medal in silver. 9.2.1861. Dublin. Award: For bravery in attempting to save lives at Kingstown on 9 February 1861 when the Neptune and several other ships were wrecked during a gale. See John McNeil Boyd for further details. Griffiths sustained severe lacerations to his knees during rescue efforts, in which he twice succeeded in saving the life of Lieutenant Dyer. Heron, William C. OS, HMS Ajax. Tayleur Fund Medal in silver. 9.2.1861. Dublin. Award: For bravery in attempting to save lives at Kingstown on 9 February 1861 when the Neptune and several other ships were wrecked during a gale. See John McNeil Boyd for further details. Heron was very active in rescuing those who were injured. Holland, Peter. HMS Ajax. Tayleur Fund Medal in silver. 9.2.1861. Dublin. Hutchison, William. Lieutenant, RN, HM Coastguard, and later Harbour Master Kingstown. RNLI gold medal; Tayleur Fund Medal in silver. 14.8.1829 and 9.2.1861. Dublin. Awards: Hutchison gained his RNLI gold medal when on 14 August 1829 the 92 ton brig Duke was driven ashore in an easterly gale at 4am at Dalkey, in Sandycove, with the crew and passengers amounting to four men, a boy, three women and three children on board. In spite of the danger of being dashed to pieces against rocks or the brig, Lieutenant Hutchison, with a crew of three coastguards and nine other men, put out through tremendous surf in the Bullock (Dalkey) lifeboat, and, having rowed three miles in the gale, saved all eleven people from the wreck. Immediately afterwards, the masthead was washed away and the brig broke up immediately. The RNLI voted its gold medal to Hutchison on 11 November 1829. Hutchison’s Tayleur Fund Medal was for bravery during the 9 February 1861 storms when he was active in attempts to save lives at Kingstown. For further details of those events see John McNeil Boyd. Biographical details: Born c1794, Hutchison was commissioned Lieutenant on 18 February 1815 and became the port authority’s haven master at Bullock, Dalkey in December 1817. The next year he was noted as having rendered distinguished service to HM brig Pandora in May 1818 when he had pilots placed aboard during a violent gale. Hutchison’s career would continue in this conspicuous pattern, principally through his role as Harbour Master at Kingstown where he was active in working with its lifeboat station and was thus involved in numerous rescues over many decades. He was promoted Commander on 14 October 1871 and it was only in 1878, when he was 84, that he resigned as Honorary Secretary of the Kingstown Branch RNLI. He died three years later, in 1881, aged 87, and is buried in Mount Jerome Cemetery, Harold’s Cross, Dublin, a memorial to him being erected in the Mariner’s Church (now the National Maritime Museum, Dun Laoghaire). Kane, Peter. AB, HMS Ajax. Tayleur Fund Medal in silver. 9.2.1861. Dublin. Award: For bravery in attempting to save lives at Kingstown on 9 February 1861 when the Neptune and several other ships were wrecked during a gale. See John McNeil Boyd for further details. Kane sustained a severe contusion to his right knee and hip. Biographical details: Kane was born in Liverpool and after first working as a shoe-maker, he enlisted in the Royal Navy. He served on HMS Ajax from 6 November 1858 until 22 February 1862, at which point he briefly served on HMS Excellent and HMS Victory, before joining HMS Shannon on 20 June 1862. He moved to HMS Aboukir on 24 February 1865, from which ship he deserted on 7 March 1865 while in Jamaica. McGonigal, Thomas. LS, HMS Ajax. Tayleur Fund Medal in silver. 9.2.1861. Dublin. Award: For bravery in attempting to save lives at Kingstown on 9 February 1861 when the Neptune and several other ships were wrecked during a gale. See John McNeil Boyd for further details. McGonigal was much shaken and sustained severe a contusion to his right knee. McLenahan, Archibald. AB, HMS Ajax. Tayleur Fund Medal in silver. 9.2.1861. Dublin. Award: For bravery in attempting to save lives at Kingstown on 9 February 1861 when the Neptune and several other ships were wrecked during a gale. See John McNeil Boyd for further details. McLenahan particularly assisted in the rescue of those men who were injured, particularly William Ferguson; McLenahan himself being very shaken. Malone, Luke. HMS Ajax. Tayleur Fund Medal in silver. 9.2.1861. Dublin. Murphy, James. Tayleur Fund Medal in silver. 26.2.1875. Dublin. Award: For bravery in attempting to save, with others, the crew of the Belle Hill, wrecked on 26 February 1875 at Balbriggan while en route from Liverpool to Valparaiso. Newham, John. Quartermaster, HMS Ajax. Tayleur Fund Medal in silver. 29.2.1861. Dublin. Award: Newham’s Tayleur Fund Medal was for bravery in attempting to save lives at Kingstown on 9 February 1861 when the Neptune and several other ships were wrecked during a gale. See John McNeil Boyd for further details. Robertson, George. AB, HMS Ajax. Tayleur Fund Medal in silver. 9.2.1861. Dublin. Award: For bravery in attempting to save lives at Kingstown on 9 February 1861 when the Neptune and several other ships were wrecked during a gale. See John McNeil Boyd for further details. Robertson sustained severe lacerations to his head during the rescue efforts. Scantlebury, William. Boatman, HM Coastguard. Tayleur Fund Medal in silver. 1-2.2.1873. Dublin. Award: For bravery on 1 and 2 February 1873 at the wreck of the schooner Sarah Ann at Balbriggan, six of the men who crewed the lifeboat being tragically drowned when it capsized during the forlorn rescue attempts, the men aboard the Sarah Ann all perishing on that freezing and stormy night. Awards also to Robert Ellison, Lot Syme and Thomas Woodley. Smart, Charles. Tayleur Fund Medal in silver. 2.2.1873. Dublin. Sweeney, Joseph. Tayleur Fund Medal in silver. 9.2.1861. Dublin. Syme, Lot. Boatman, HM Coastguard. Tayleur Fund Medal in silver. 1-2.2.1873. Dublin. Toomey, James. RNLI silver medal; Tayleur Fund medal in silver. 9.2.1861. Dublin. Award: Toomey received both medals for bravery in attempting to save life on 9 February 1861, when at great risk to himself, Toomey waded in to the surf and helped to save the Mate of the Whitehaven schooner Industry, which was wrecked off Kingstown in a heavy gale. Lieutenants Hutchinson and Parsons also rushed into the surf in attempting to save the Master. The RNLI voted its silver medal to Toomey on 1 August 1861. See John McNeil Boyd for further details. Twohig, Richard. Commissioned Boatman, HM Coastguard. Tayleur Fund Medal in silver. 2.2.1873. Dublin. Walsh, John. Lloyds Agent. Lloyds Medal for Saving Life (at Sea) in silver; RNLI silver medal; Tayleur Fund Medal in gold. 9.2.1861. Dublin. Award: Lloyds record the award of: “The Honorary Silver Medal to Mr John Walsh, Agent for Lloyds at Dublin, to mark the sense entertained of his praiseworthy and gallant conduct, in endeavouring, at the risk of his own life, to save the Crew of the Brig Neptune, wrecked on the outside of the East Pier of Kingstown Harbour during a heavy Gale on the morning of 9 February 1861, on which occasion he received severe injuries, and Captain John McNeill Boyd, RN of HMS Ajax, and five of his Crew lost their lives”. The RNLI citation for its silver medal, which was voted to Walsh on 7 march 1861, notes that ‘Walsh rendered general gallant services in helping to save lives from shipwreck over many years and his record was enhanced by the part he played in rescue attempts to the brig Neptune in which he sustained severe internal injuries’. See also the entry here for John McNeil Boyd for further details. Wick, William. HMS Ajax. Tayleur Fund Medal in silver. 9.2.1861. Dublin. Wingate, Richard. HMS Ajax. Tayleur Fund Medal in silver. 9.2.1861. Dublin. Wisnom, William. Captain. Tayleur Fund Medal in silver. Antrim. Award: The only details known about this particular award are that it was for saving life in Belfast Lough. Woodley, Thomas. Boatman, HM Coastguard. Tayleur Fund Medal in silver. 1-2.2.1873. Dublin. Award: For bravery on 1 and 2 February 1873 at the wreck of the schooner Sarah Ann at Balbriggan, six of the men who manned the lifeboat being drowned when it capsized during their rescue attempts. See William Scantlebury for further details. Woodley’s medals (Tayleur Fund medal, Baltic 1855 medal, New Zealand War 1860-65 medal and a Naval Long Service and Good Conduct medal) were retained by the family until the summer of 2004 when his granddaughter, Monica Daly, presented them to the Howth Coastguard Station. For details see Fingal Independent, Friday 6 August 2004. Biographical details: Before becoming the Chief Coastguard Officer at Howth, Woodley had served for some time in the Royal Navy, seeing action during the Baltic campaign of 1855 and later in the second New Zealand war when he served aboard HMS Pelorus as the Captain Mizzen Top (a petty officer rank). When Woodley later retired from the Coastguard service, c. 1893, the presentation then given to him was recorded as follows by the local newspaper: ‘On Sunday evening Mr Thomas Woodley, lately Chief Officer of Howth Coastguard Station, was the recipient of a Testimonial from the people of Howth, the occasion being marked by a supper in the St Lawrence Hotel, given by some residents. The Testimonial took the shape of a valuable gold watch, on which the following was engraved – ‘Presented by a number of his friends to Mr Thomas Woodley, Chief Officer, Coastguards, at Howth, on the occasion of his retiring from the service, 1893’. Mr Woodley, during his service in the Coastguards, was instrumental in saving many lives from drowning, for which he received several medals, as also for long service, good conduct etc. He spent the last 12 years in charge of Howth Station, and now retires on full pension, having won the esteem and good wishes of all who knew him’. Woodley died in 1917. Wright, William. Yeoman of Signals, HMS Ajax. Tayleur Fund Medal in silver. 9.2.1861. Dublin. Award: For bravery in attempting to save lives at Kingstown on 9 February 1861 when the Neptune and several other ships were wrecked during a gale. See John McNeil Boyd for further details. Wright was very shaken and received a contusion on his head during his participation in the rescue efforts. Wilson, J. (1994). “The Tayleur Fund Medals”. LSARS Journal, 22: 4-49.